It's true: nothing about a traditional cheesecake is dairy-free or vegan, from the cream cheese to the sour cream to the eggs to the butter in the crust. But, for those of use who love cheesecake but can't do the dairy due to allergies or dietary preference, there are ways to make a cheeseless and eggless cheesecake delicious. From classics like plain cheesecake and chocolate to more dressed up versions like banana cream and mint chocolate chip, you'll find fabulous alternatives to dairy-laden cakes in the list below. 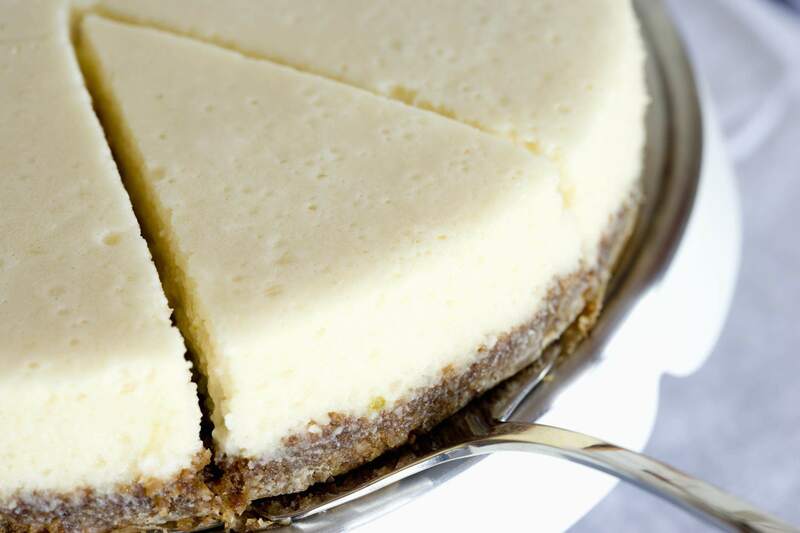 There's nothing quite like a classic, but this Plain Cheesecake recipe takes the classic to a healthier yet amazing new level, substituting both the cream cheese and eggs found in traditional cheesecake recipes. I often prepare this recipe as written--with a homemade cookie crust--but feel free to prepare a more traditional Graham Cracker Crust instead. Dairy-Free Blueberry Cheesecake. And vegan, too!. © 2012 Ashley Skabar, licensed to About.com, Inc.
Dairy-Free Cherry Cheesecake. © 2012 Ashley Skabar, licensed to About.com, Inc.
A rich creamy filling is baked atop a graham cracker crust and then topped with a cascade of sweet cherry sauce--and it's dairy-free AND vegan! Topped with vegan ganache, this vegan cheesecake is really special. © 2008 Ashley Skabar, licensed to About.com, Inc.
A rich, homemade chocolate cookie crust and a creamy vegan chocolate cheesecake filling are all you nee to make someone smile. But, you can also top it off with Vegan Ganache if you feel like it. Just sayin'. Vegan Chocolate Peanut Butter Cheesecake. © 2012 Ashley Skabar, licensed to About.com, Inc. This Chocolate Peanut Butter Cheesecake is a fun take on the classic creamy cake, and it's always a winner with kids. Peanut butter and chocolate is always a winning combination, and in this vegan cheesecake, the flavors sing!